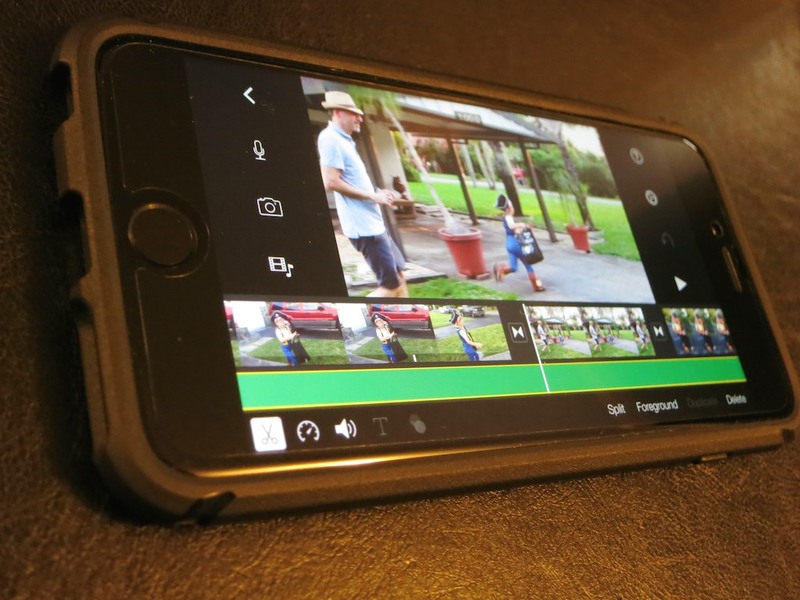 When iMovie came out as an app, I scoffed at what I believed was a preposterous idea that complicated video editing software could successfully be shrunk into an iPhone. I come from a world of multi-core, decked-out computer monsters that often ‘render’ their imagery overnight to crank out their completed videos on deadline. I viewed the iMove app as little more than a toy. Then, Apple gave it to me for free as part of my new iPhone 6 Plus purchase. But I would not open it. Then, I discovered the wonders of my iPhone’s slow motion video capture capabilities. And I was especially taken with my iPhone’s ability to isolate a particular portion of a slo-mo clip and then only play that part back in slow motion. Now, you can utilize slow motion only when a particular moment needs it. I couldn’t export the clip to my iMac and retain the selected slow motion. Yes, my computer accepted the clip recorded at 240 frames per second. Yes, QuickTime offered me the choice to play the clip either at normal speed or in slow motion on my Mac. But the ‘selected slo-mo’ clip I had created in my iPhone had vanished. Sure, I could recreate the effect on my computer with editing software, but that’s doing the work all over again! So I looked again at the iMovie app on my iPhone. I opened it up…did a quick tour…and imported the clip in question. Then I realized I could simply export the clip out of iMovie in its native resolution to lock in the selected slow-motion moment. Using iMovie in this way is indeed an extra step…. But it’s not that arduous. And it solved my dilemma! Then, did I lightly touch ‘export’ and chalk up another minor victory for humans co-existing with their tech? The clip in question was one of three I had recorded of my son having fun on Halloween night as a pirate. All three had been shot in slow motion…more as part of an experiment than anything else. I performed some selected slow-motion tweaks on the other two clips, then brought them into iMovie as well. I quickly drizzled some dissolves between the clips, imported a Halloween night photo for the top of the video and blended in a Ken Burns’ zoom/pan. Then I typed in an opening title, selected a pre-existing iMovie ditty for a background music track, and faded the ending to black. It was twenty minutes later. …And I had easily created this cool little video. So I am happy to report you can teach an old dog new tricks. No, I’m not going to forget about using uber-powerful Mac Pros in favor of the iMovie app on your iPhone. But indeed, I finally recognize there’s a lot you can do on the fly editing short videos on your iPhone or iPad. If I’m not the last human on earth to have this epiphany… you should know you’re carrying a legitimate video editing station in your pocket right now.